Keeping up a cleaning schedule for your RV is imperative to the livelihood of your rig’s outerwear. Ignoring dirt and other residue from your travels can have lasting effects and lead to serious staining and corrosion on your RV’s body. We recommend washing your RV a minimum of two times per year. Be mindful of your travels and if you’ve visited coastal areas where sand can hit your RV, you may want to give it a routine wash to avoid any damage. Washing your home on wheels requires many of the same items used to wash your normal car or truck, with a few exceptions. A staple vehicle washing item, you can never go wrong with a lamb’s wool wash mitt. These products are safe to use all over your RV, can really get some suds going, and also do not leave any lint behind. For reaching the higher areas of your RV, a ladder (and even some helping hands) is a must. It helps if you have a friend to guide you along the way as well as some water-friendly shoes to avoid slipping. There is a lot of space to cover when it comes to your RV, so make things easier on yourself by purchasing an extension pole washer with soft bristles. This tool will help you cover more surface area quicker and limit your dependence on the ladder. It is recommended to use a car-specific soap and wax, as other soap types are known to dull the surface of your RV. By far our oddest RV washing tool, dryer sheets work perfectly for removing bugs from your RV. Simply dip the sheet in water and rub on surface, following with rinsing and washing. A great tool to get a lot of drying done, super absorbent synthetic towels are affordable and won’t leave you with soaking wet towels when finished. Now that you have all the proper tools, let’s get to the cleaning! To prevent any unwanted drying and water spots, avoid parking in direct sunlight, or have a partner to help you dry as you go. Begin by giving your RV a nice rinse to remove any dirt, and then head to the roof. An extension pole washer can be very handy when cleaning the roof of your RV, and also make sure you have slip-proof shoes. If at any point you feel overwhelmed or unsafe during this task, it never hurts to hire someone or visit a truck wash.
As you make your way from top to bottom, use your washing mitt and extension pole cleaner with the soap and wax mixture, spending extra time on any problem areas or stains. Also keep an eye out for any exterior cracking and repair accordingly. 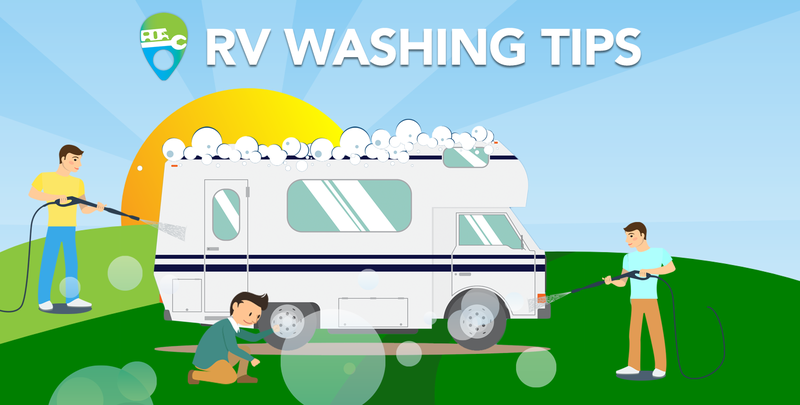 We hope you enjoyed these RV washing tips and we wish you the best of luck in your journey to a clean RV!